I made *another* felt! | carpe diem! The weather has turned cold and wet and I found myself working at the computer wearing the bag because it is comfortable. And comforting. The wide strap warms my chest and back and sits on my shoulder like the hand of a friend. The bag itself curls around my hip as though it was some sort of adhesive cat. It’s beautiful to look at, too. I chose the Manos del Uruguay wools online, and the ‘Citric’ I chose as an accent looked painfully bright In Real Life against the ‘Granite’. But I persevered, and indeed the felting process softened the contrast, possibly because the Granite shed a lot of brown dye. I know this because I tried to felt it by treading it in the shower (don’t try to picture that). It didn’t work, so I tied it in a pillowcase and put it and my Tevas (never miss the opportunity to try to get those clean) through the wash and first spin of a cotton cycle in our Dyson front loader. The detail is intended to show that once again I’ve produced something that looks like a rock, and I love it. Geology Rules! Knitting, er, Rocks! Anyone else thinking of felting Manos for the first time should note that ‘Manos del Uruguay felts beautifully’ means it felts at something approaching lightspeed in the wash. I panicked when I saw how small it had become, but it stretched. It had not choice but to stretch, what with my foot in the bag pushing while both hands pulled the strap… Another caution: do the i-cord edging very loosely indeed. I became increasingly tense as I convinced myself I would run out of Citric (no chance), which made the i-cord tense too. I had to Seriously Stretch it to make the strap lie flat. US size 11 needles got gauge and knitted according to the book I’ve got enough of both wools left to make a bigger bag/longer strap. Given the Dyson is the only washing machine I’ve got, next time I’ll make the strap a couple of inches longer, and I’ll use the rest of the everything to make the bag a bit bigger. Things learned in addition to relaxing the i-cord? I finished the bag using the ‘three needle’ bind/cast-off, which basically amounts to knitting the seam. It’s brilliant. I love it, and I want to work out how to do that to shoulder seams even if it means learning short-row shoulder shaping: so much tidier/easier/less hassle than sewing. I kitchenered/grafted the i-cord and couldn’t see the join even before felting, which was extremely satisfying (is that sad?). 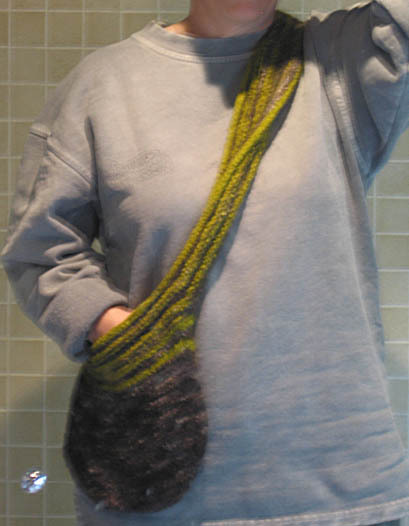 I have to get some more Manos ASAP: I have to make more fuzzy, friendly bags. This entry was posted in Uncategorized on May 15, 2006 by sarahw. Ha ha! Thanks for a good laugh! Not only that, but a very informative post. However, you do realise that as soon as anyone says, “don’t try to picture this”, of course that is exactly what we do. I am with you on the bag – it’s absolutely lovely and the colours really complement each other. I haven’t tried felting yet but keep meaning to. And I keep hearing about the 3 needle thing. Must look it up. And I’m wondering if your Dyson w-machine is lime green as well………They do come in some funny colours! I just thought I’d better add a disclaimer: I am NOT responsible for any injury (mental or physical) incurred by any visualisation of anything I write about… it’s your brain, you train it 🙂Do try felting. 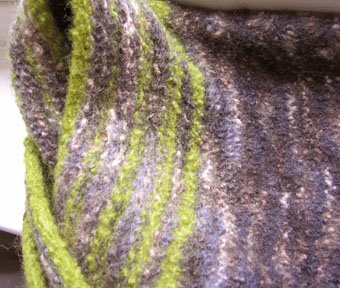 It’s so interesting: the knitted fabric metamorphoses into something different, sturdier and more functional (sez I based on precisely two deliberately felted objects 🙂 I’m thinking about buying used sweaters or scrap fabric to felt and patch into afghans or rugs as a good way of learning more about the process. I’ve never been keen on felt Art, but these functional felts are lovely. ps. the Dyson w-machine is white. I couldn’t *quite* summon the courage for the purple and silver one!